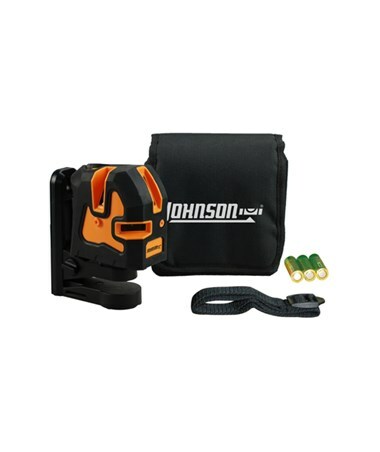 The Johnson Level Tri-Line Laser comes with many useful features such as being able to turn on one horizontal line, or one vertical line or two vertical lines that are 90 degrees to each other. When all three beams are on, the laser beams from three cross lines. 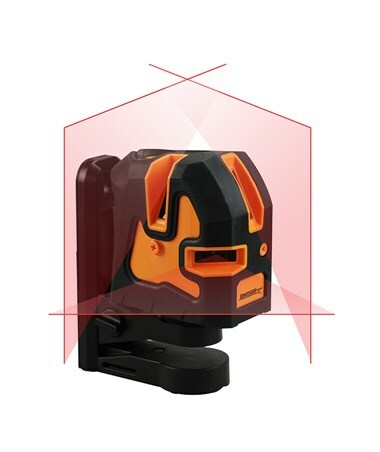 This cross-line laser can be used for a variety of interior or exterior applications such as installing cabinets, shelving, baseboards, doors, and windows, hanging pictures, setting concrete forms or installing fence posts and many more. It also features a manual mode that allows the user to generate uneven lines that are ideal for marking a stair railing. The laser beams have an interior range of up to 200 feet depending upon light conditions. It can also be set to pulse mode for use outdoor with Line Generator Laser Detector (not included) to extend its range up to 300 feet. Included with the laser is a multi-functional elevating magnetic bracket that allows the horizontal laser beam to be raised or lowered 2 1/2" for precise laser beam placement. When the laser is mounted on the bracket the laser can hang on a wall, be attached to any metal surface or be connected to a tripod with 5/8"-11. 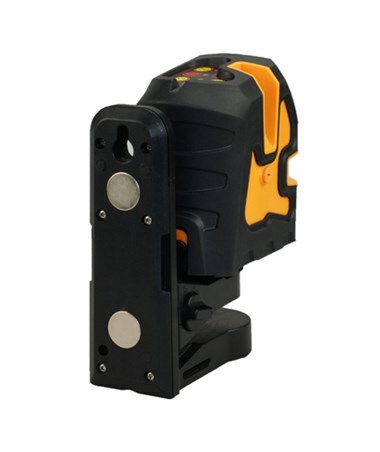 This Johnson Level Tri-Line Laser can also rotate on the bracket 360 degrees. This self-leveling laser feature a locking, magnetic dampened compensator to protect the pendulum during transport and an out of level warning with flashing beams and audible sounds. 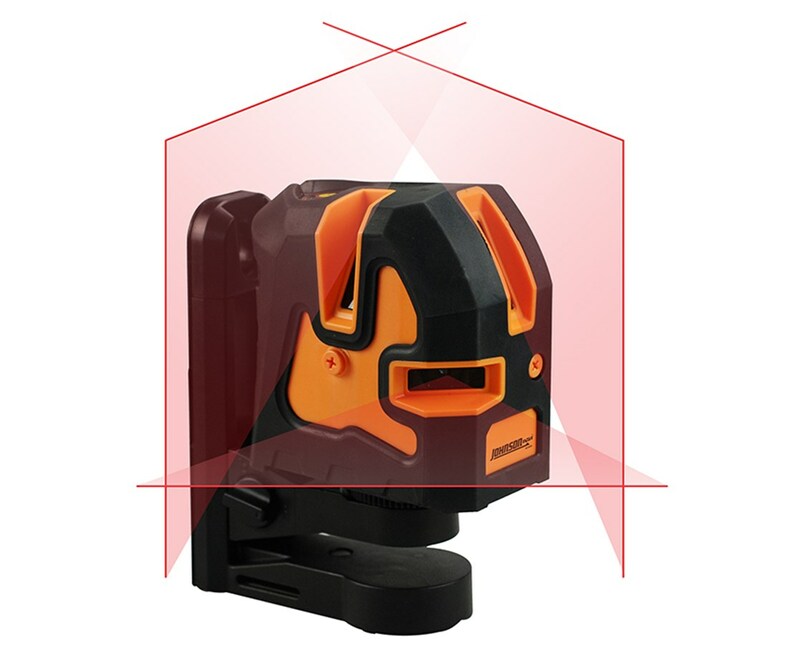 It is accurate up to ±3/16 inches at 50 feet and ±3 degrees self-leveling range. Water and dust proof with an IP protection class of IP-54. The laser includes a multifunctional magnetic base, three "AA" alkaline batteries, mounting strap, instructions manual with warranty card and soft-sided pouch. It also comes with a 3-year warranty. Laser can be raised or lowered 2-1/2"
Working Range Up to 300 ft. Range with Receiver Up to 300 ft.